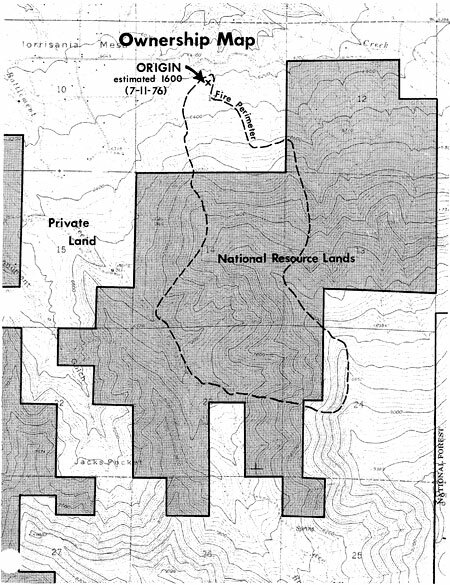 The action leading up to the time of BLM's initial attack on July 15, began 4 days earlier, July 12, on private land. Sunday, July 11, a severe lightning storm struck the Morrisania area late in the afternoon. Much of the lightning activity occurred in the vicinity of the Eames Orchard. This lightning activity was followed by what was described as a moderately heavy shower. Records indicated .06 rain fell in the town of Grand Junction, Colorado, approximately 40 miles southwest of the mesa lying in the Colorado River valley. No fire was reported at that time. On July 12, at approximately 1330, a fire was reported in SE¼, NW¼, Section 11, T7S, R95W, at Eames Orchard (fig. 8). This fire was controlled by 1700 at 1/2 acre by the Grand Valley Volunteer Fire Department. BLM air patrol (783) confirmed the fire was no longer smoking at 1925. At 2130, a lightning strike was observed by a local citizen in approximately the same vicinity which resulted in an immediate fire start. The Grand Valley Volunteer Fire Department responded to this fire with five men and a ground tanker. They contained the fire and returned home at 0300, July 13. During the daylight hours of Tuesday and Wednesday, July 13-14, a smoke surveillance was maintained of the area by the captain of the Grand Valley Fire Department from his place of employment and by other members of the department at varying times. On Thursday, July 15, at approximately 1400, smoke was again noted in the area by the residents of the Eames Orchard, and a call was placed to the Grand Valley Fire Department. Two men from the Grand Valley Department responded, arriving at the fire approximately 1430. They found the fire was again in the same location they had taken action on twice the previous Monday. The two men were just starting suppression action when an increase in wind velocity was noted. The fire jumped about 20-30 feet to the south and southeast into sage and cheatgrass fuels and spread rapidly. The pumper was considered to be in danger and the men moved the vehicle and radioed for assistance. The fire was gaining momentum and velocity; the men decided to remain on the west side of the fire and wet down that area with the water they had. The wind velocity kept increasing at this time. At approximately 1430, the Grand Valley Fire Chief went to the north of the area on a higher mesa some 5 miles distant and had the area in observation. He reported observing a pattern of fire about 50 yards wide moving rapidly southeast. The Grand Valley Fire Captain reported observing a cloud of fire and smoke erupt from the area at a time of 1500. His location was about 6 miles northeast of the fire. Additional manpower and equipment were dispatched to the scene by the Grand Valley Fire Department (time undetermined). At 1510, July 15, Wayne Fisher, BLM, radioed Grand Junction Fire Dispatch a location on the fire from his visual observations from some distance away. Grand Junction District Fire Management Officer Roy Johnson initiated BLM action at 1522 while on an aerial observation flight. The initial order was for a retardant drop and two helitack crews. An additional retardant drop was ordered almost immediately. At approximately 1600, the Fire Boss Jack Haslem, a local district employee, was alerted and two 20-man crews were ordered. At 1548, BLM air tanker No. 59 was dispatched with an ETA of 15 minutes and the county fire department had been advised to clear a drop zone. The Grand Valley crew on the fire reported the first retardant drop at 1600. They had pulled back to the Eames Orchard prior to arrival of the air tanker. Several local pumper, volunteer, BLM and Forest Service crews continued to work along parts of the fire the night of July 15. Three air tankers, two 1,000-gallon B-26's and a 2,000-gallon C-119 worked hot spots until dark. The pumper-crews patrolled the west side from midnight to 0600 July 16 to prevent the fire from crossing the road to the west. From the beginning of suppression effort on July 15, the attack strategy was designed to prevent western and southern spread of the fire. The presence of natural gas lines and wells to the west and Project Rulison to the south influenced this decision. Later, on July 16, the fatal crash of an air tanker near the fire was also an unusual event. Project Rulison - This program was sponsored by Austrol Oil of Houston, Texas, and Los Alamos Scientific Laboratories under the supervision of the Atomic Energy Commission. It was conducted to stimulate the natural gas pockets and facilitate gas collection by underground nuclear explosions. Remaining at the project site are two above-ground metal holding tanks which contain some explosive vapors. Also contained in the tanks is a small amount of material which presents a low-level radiation problem. The well is closed with plugs at the bottom and also the top of the shaft. The valves have been closed and chain locked. Plans are to close the site in the near future by removing the tanks and cementing the shaft closed. Aircraft Accident - On Friday, July 16, 1 day before the crew accident, a B-26 air tanker crashed on a retardant dropping mission on the Battlement Creek fire. The accident occurred at 0856, approximately 1 mile south of the fire. The pilot was killed. The crash diverted the line boss and the Sawtooth interregional crew for much of the day in controlling a fire at the crash site and removing the pilot's remains. Although this accident is not related directly to the crew fatalities and injuries, it could be an indirect factor affecting overhead attitude and response. Although the line boss and one crew were diverted to the crash site July 16, there were, however, no direct actions taken on the Battlement Creek fire as a result of this aircraft accident.